Kozhikode, November 04, 2018: Chennai City FC continued their impressive campaign in the 12th Hero I-League, winning the season’s first Southern Derby against Gokulam Kerala FC in a five-goal thriller at the EMS Corporation stadium in Kozhikode on Sunday. They now top the points table with seven points from three games. In an ‘edge of the seats’ encounter, Chennai rode on goals by Pravitto Raju, Pedro Manzi and Ameerudeen to get the better of their hosts. Grenadian forward Antonio German scored off a penalty to give Gokulam an early lead and then V.P. Suhair got one back with a brilliant individual effort but it turned out to be futile for coach Bino George’s side in the end. Gokulam coach Bino George opted for a change of tactics on the day playing Antonio German on the right wing and Suhair as the target man up front. Surprisingly both Baoringdao Bodo, the goal scorer in the last game and S. Rajesh, who has been so impressive in the Hero I-League did not get a start. Pritam Singh started the game and Deepak Kumar was also replaced by under-22 Monotosh Chakladar in defence. Chennai’s Singaporean coach Akbar Nawas, on the other hand, played Gaurav Bora in defence instead of Tarif Akhand who had been getting starts in a straight under-22 swap. In what turned out to be a free-flowing and open game of football, Gokulam started stronger in the attack. As early as the second minute, German cut through and floated in a left-footed cross which was met by Suhair inside the visitor’s box and lobbed up for Arjun Jayaraj who executed a wonderful bicycle kick which was blocked by Kabir Taufik in the Chennai goal. Referee Crystal John, however, saw an infringement in the melee and pointed to the penalty spot. German slotted home to give the hosts an early lead. Chennai left winger Nestor Jesus of Spain then got into the game in what was to be a virtuoso performance as the away side began hunting for an equaliser in right earnest. An Ajith Kamraj attempt hit the woodwork, a Pedro Manzi shot was blocked by Gokulam keeper Shibinraj, another effort by the Uruguay-born Spaniard hit the woodwork yet again and a Romario Jesuraj effort to slot the ball in through Shibinraj’s legs off a Nestor through ball also did not get the desired result. Then in the 22nd minute, Nestor ran into the box and his cross was parried only towards an onrushing Pravitto Raju who slotted into an empty net. Another wonderful piece of skill by Nestor, in the 31st minute, saw him break free again on the left flank and release a perfectly-weighted through inside the box in an area which compelled both an onrushing Shibinraj and defender Daniel Addo to go for it. Ghanian Addo reached first and made a faint sliding contact. It took Shibinraj out of the equation and Pedro Manzi, who was on Addo’s shoulder all the while, found an empty net in front of him to tap in his fourth goal of the 12th Hero I-League campaign. Just before the break though, the hosts had a golden chance to equalise. In the 40th minute, Arjun Jayaraj, on the counter, released an overlapping Abhishek Das to his left and his run helped him break away from his defender and find an open first post. With keeper Kabir out of position, Abhishek opted to cross to an unmarked German on the right instead of going for goal himself and it was intercepted by the diving keeper. Just before the break, Chennai’s leading goal scorer Pedro Manzi had to leave the field due to injury and was replaced by Ameerudeen. It was Ameerudeen who, in the end, took the game away from the hosts having struck in the 68th minute to help Chennai go 3-1 up. On the break, Mashoor deep inside his own half, found Nestor in the middle of the Gokulam half with a perfectly measured long ball. Nestor yet again executed a perfect through to Ameerudeen who beat Shibinraj calmly for a wonderfully executed team goal. A minute later, the Chennai defence were caught off-guard when Suhair had a moment of individual brilliance. He received the ball just outside the Chennai box on the left and moved to his right leaving two defenders in his wake before unleashing a powerful right-footer to beat Kabir all ends up to bring Gokulam back into the game. Bino had thrown everything into the ring with the introduction of Rajesh early in the second half as well as new Ivorian signing Kouassi later in the half. However, try as they might, the Chennai defence led by the unsung Spaniard Roberto Eslava held firm to help them come away with a crucial three away points. 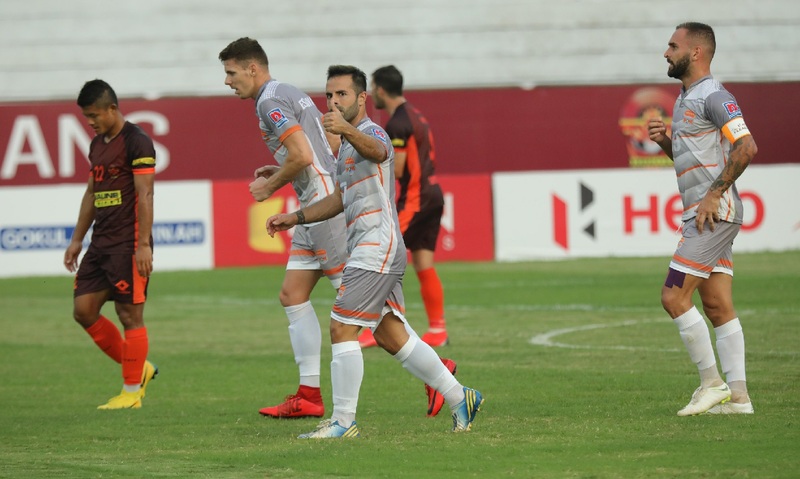 Mudde Musa, the Gokulam captain, lashed out at Ameerudeen in clear frustration, in the dying minutes of the match to get the first marching orders of the Hero I-League 2018-19 season.